This entry was posted in Seasonal and tagged garden pest, Haiku, hawkmoth, tomato hornworm. Bookmark the permalink. Debbie, when I first looked at your photograph, I didn’t quite know what it was. I thought that it might be some kind of exotic plant or flower. WOW…it’s a tomato hornworm!?!? Yes, I bet it was creepy when you spotted the thief; especially when you saw it moving. YIKES! When I lived in Florida, I would spot lizards on the patio munching on the leaves of the plants. But they were very hard to see because they had the ability to change colors so that the were camouflage. Hope you’re having a fabulous Sunday, my friend! Oh, Ron, I remember those little patio lizards, too. Once, one got inside our apartment, and three of us girls were standing on chairs hollering until some poor fella came by to remove it!! P.S. Happy Birthday, my friend — it’s this week, right?!! Why do I suddenly hear Joni Mitchell singing “Both Sides Now”? You’ve shown both perspectives of this issue in a very clever way! Believe it or not, I’m working on my new post, which involves — a hawkmoth. It’s not this species, though. I don’t know what ‘my’ hawkmoth caterpillar feeds on, but now I’ll look it up. I presume you dispatched this critter, post-haste! 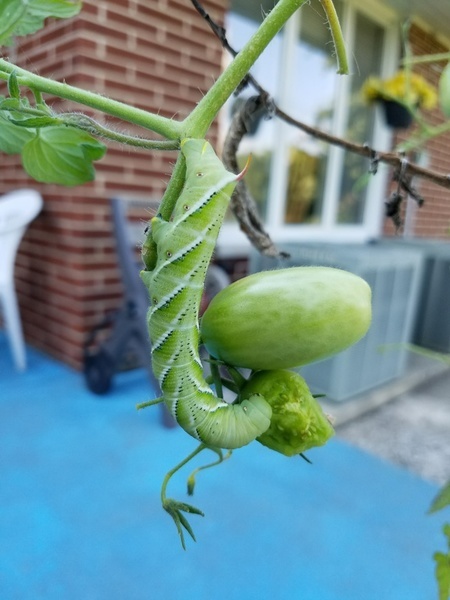 I know every creature needs to eat, but not on my tomatoes, thank you very much. Linda, I understand these critters like lots of different plants, so you’ve got your work cut out for you! I’d have enjoyed seeing this thing if it had been in moth form, but anything “wormy” or “snakey” just gives me the heebie-jeebies! It’s funny because I went outside daily (several times a day, actually) with Dallas to check on things and one day my tomato was fine; the next, there Wormy was! Yes, I snipped the entire limb off — worm and all — and disposed of it. I refused to step on it, and fortunately, he’s not returned. I used to hate these guys when I had tomatoes. It was almost like they grew overnight. I like the two views. Well done. That exactly it, John — I’m positive he wasn’t there the day before. Where he came from, I’ll probably never learn. No matter — he’s long gone!! OMMMMgggooodness, that thing is AWESOME))) !! God is amazing. I like to think God has a great sense of humor, Kim. Can you imagine what fun it must have been designing a critter like this?!? They creep me out too! Glad to know I’m not the only one, Cindy! Look at that horn-thing on its tail, yuck!! Ugh! Please tell me that’s massively magnified! I’d run a mile… and a half! Uh, no, no magnification at all — sorry! It’s a close-up shot, and I’d guess Wormy was about 3-4 inches long. A big boy, ha!! So now I can’t eat my breakfast after seeing that! LOL! Sorry, Tanya! But hey, you weren’t eating tomatoes for breakfast anyway, right?!? You’re right…I was just joking.